Hangman is a simple word game where the computer attempts to discover a secret word by guessing one letter at a time. 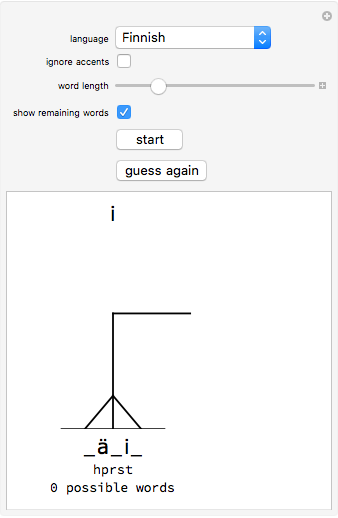 Each time the computer guesses a letter which does not appear in the word, the hangman picture is drawn further. It must discover your word before the man is hanged. Think of a word, then set the slider to the correct number of letters and press "start." 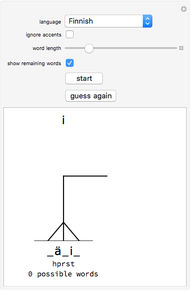 The computer will display the letter that it guesses and you must click on the dash that represents the position in the word where the letter appears. If the letter appears more than once, you must click on each of the positions. 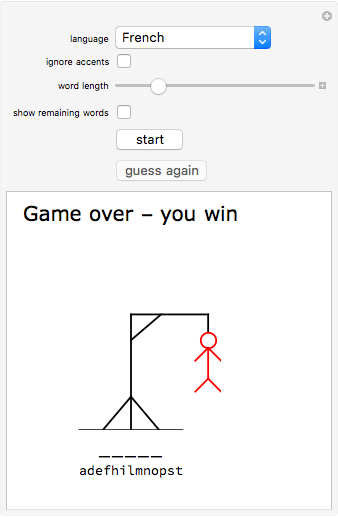 When you have clicked on all positions, or if the letter does not appear, tell the computer to continue by clicking "guess again." 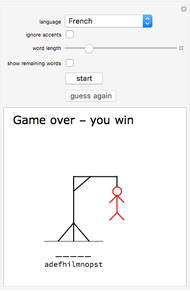 The game can be played in 23 languages. You can choose to use a 26 letter alphabet or to treat accented characters as different. If you choose "ignore accents" and you word contains, for example "ç" you should accept a guess of "c" from the computer, if not you should wait for it to guess "ç". 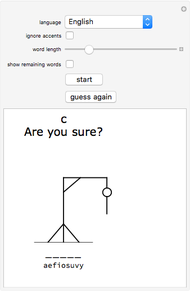 Jon McLoone "Hangman Word Game for a Computer Player"